Pepino dulce (Solanum muricatum Ait.) should be harvested when ripe (yellow) to have the best flavor quality. Skin color changes with ripening from green to pale white to cream to yellow (with purple stripes). Pepinoes soften as they ripen. 7.5-10°C (45-50°F); storage potential = 4-6 weeks, depending on cultivar and ripeness stage. 8-12ml CO2/kg·hr at 20°C (68°F); non-climacteric respiratory pattern. Exposure to 10-100ppm ethylene stimulates chlorophyll degradation (loss of green color) and respiration rate of mature-green pepino fruit, but has no effect fully ripe (yellow) fruit. Chilling injury. Storing pepinoes at temperatures below 7.5°C (45°F) for two weeks or longer, depending on temperature, will result in chilling injury. Symptoms develop upon transfer to higher temperatures and include pitting, skin browning, and flesh browning. Ripe pepinoes are less sensitive to chilling injury than partially-ripe or mature-green fruit. Alternaria Rot. 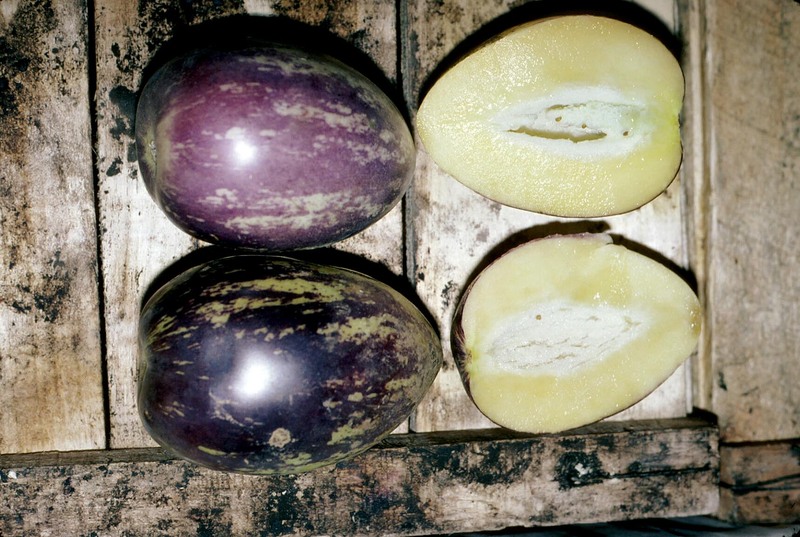 Pepino fruit, especially when chilled, are susceptible to Alternaria Rot caused by Alternaria solani. Symptoms include dark-brown to black spots beginning at the stem end and expanding to the rest of the fruit. Control strategies include minimizing mechanical injuries during harvesting and handling and avoiding chilling injury and water stress by maintaining the optimum ranges of temperature and relative humidity throughout the handling system.